Earlier this spring I got a set of Rose Northern Lights. I had the perfect pattern and the perfect yarn from my stash all picked out for their inaugural project, but I needed to finish Loopy Academy first. Now that Loopy Academy is finished until fall, I pulled out my pink needles and cast on! 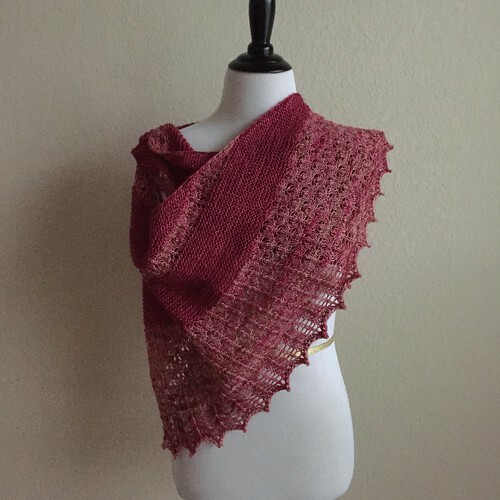 The pattern is Pink Memories and the yarn is Tess Designer Yarns Silk and Ivory. I bought it at MDS&W back when we lived in Virginia and it's been waiting for the perfect project. I think the colorway is Raspberry, but I really have no idea. Pink needles, pink yarn, pink stitch markers, and a pink pattern, all for a sweater for the Pink Lemon! Loopy Academy Extra Credit, Finished! I've finished my extra credit for Loopy Academy! 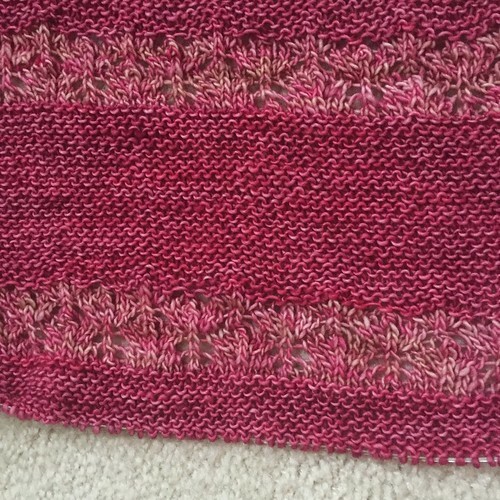 I made On the Spice Market with Loopy's Solid Series yarns. I love these yarns because they have a pretty complete color range, but they're also a nice quality superwash, soften up quite a bit when they are washed, and the fact that they come in 50g skeins, makes them affordable for color work. One of the fun things about this design is all the colors you get to use, and this was a project that made me glad I had bought the color cards! I used Cornflower for the main color and the contrast colors (in order from CC1 to CC6) are Pesto, Olive, Pine, Evergreen, Lake, and Navy. This was such a fun project to knit, even though it was a lot of knitting. I kept going just to see the next color change! I did make one change to the pattern, on the second set of stripes, I made mine all the same size. I had plenty of yarn, so I just worked three repeats of Section 4 in each of the colors. This probably made my shawl a little bit bigger, but since it's essentially a wearable blanket anyway, I'm not going to sweat it. I'm now finished with Loopy Academy for another year (Year One for sewing and Year Two for knitting), all my pictures and project details are turned in and awaiting approval! I've decided not to do Camp Loopy this summer, but I'll be back in Loopy Academy this fall. I'm going to be working on some random stash projects, and finishing up a few things, and sewing this summer! I pulled the Carson Throw out last night so I could get some work done on it. I haven't done much with it this month between finishing up Loopy Academy (extra credit is blocking!) and the Mad May/ESK Free For All KAL. Now that those are off the needles, I can get back to Carson - or so I thought. After about one round, someone discovered that the Carson makes it's own cave, and promptly climbed in to explore. Then he fell asleep. I just went with it. Maybe I can get some work done on Carson during his big daytime nap today. I'm obviously not going to get the remaining 25 rounds for this month completed by the end of the month, but I was planning on dragging my Carson out an extra month to get the Long Haul Boosterthon badge anyway, so I'm still on track for that. 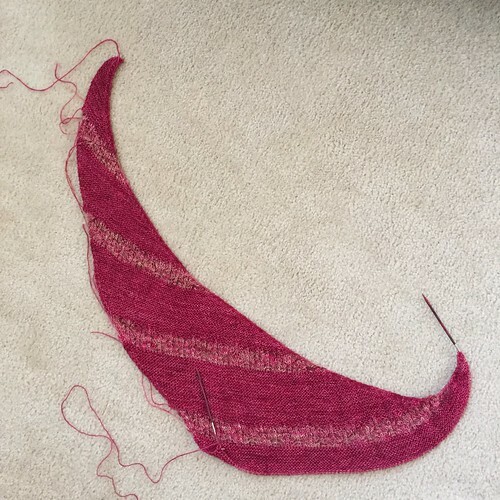 You've seen the start of this pattern twice before, but the yarns were all wrong. This time, all is right with the world. The gauge is right; the color is right. This time the socks will be completed! The pattern? Oh, that's Twisted, but I added three rounds of knit at the beginning, to get the little roll at the top. The yarn is Blue Moon Fiber Arts Socks That Rock Lightweight in H.R.H, Crown Princess of Purple, Violetta (yes, that's the color name). It was a skein from the Rockin' Sock Club one year. This time, I will get my pair of Twisted socks! I'm hoping to get the knitting finished in the next few days so I can get the ends woven in and get it blocked. It doesn't need a hard stretching, and I might just take Sir Steamy (my iron) to it and give it a good overall steaming. I can decide that after I finish all the knitting. I've got until May 31 to get the photo uploaded, but that's coming faster than I think. I finished my Winchester socks! These are just plain vanilla socks, stockinette with ribbed cuffs. I knit them in Blue Moon Fiber Arts Socks That Rock Lightweight in It's a Supernatural Thing (hence, the name: Winchester socks). The pooling worked differently on each sock and I don't know for sure if it was a tension thing, or a dyeing thing, or both, or maybe evil pixies. It's hard to tell. I'm OK with them not being identical twins though, they're still clearly related to each other. I will be spending the weekend working on my On the Spice Market. 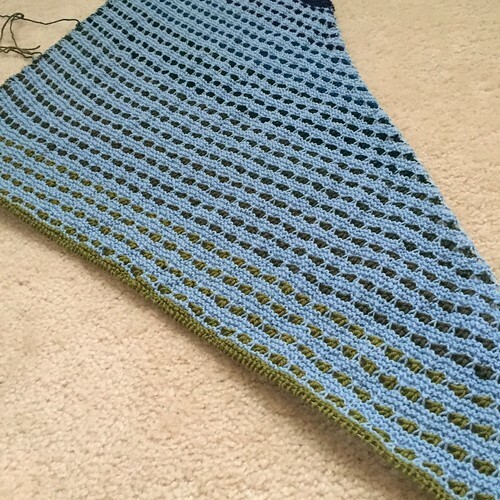 I also need to get back to my Carson throw. 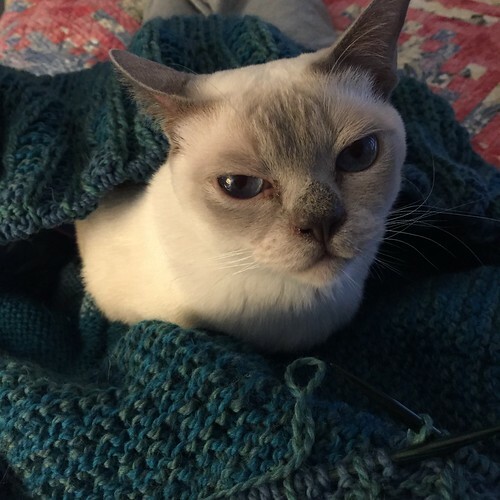 That thing isn't going to knit itself! 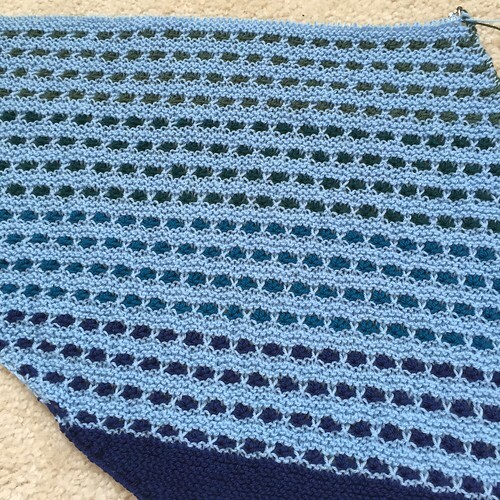 I've finished my Oceanbound (or Wine Dark Sea, as I'm calling the project). This was knit for Mad May (the Madelinetosh KAL) and Eat Sleep Knit's May KAL. I used Madelinetosh Tosh Merino Light in Vermillion and Fragrant (both have just recently been discontinued). The project was fun to knit and even the lace was easy. I didn't measure it after blocking, but I can tell you it's huge. You can see that from the length of the drape on Fifi. Why is Fifi modelling it, you ask? Because Logan just wasn't feeling like modelling this morning. 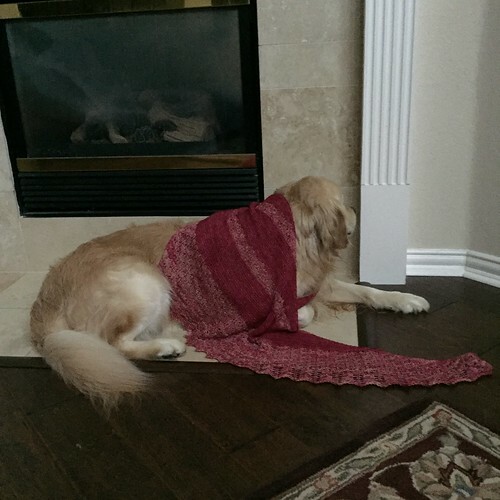 I think Max started taunting him right after this picture, because as soon as I snapped it, he was chasing Max, still wearing the shawl. The shawl was rescued and I went to Fifi for help this morning. 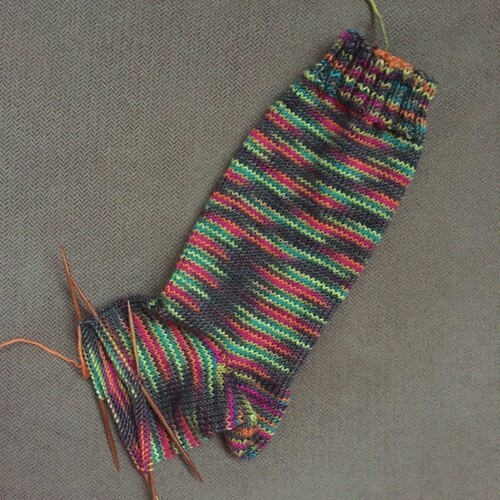 I've finished my first Winchester sock, and gotten a good start on the second! I'm definitely preferring this yarn in a simple, stockinette sock with no frills. The yarn is BMFA Socks That Rock in It's a Supernatural Thing. 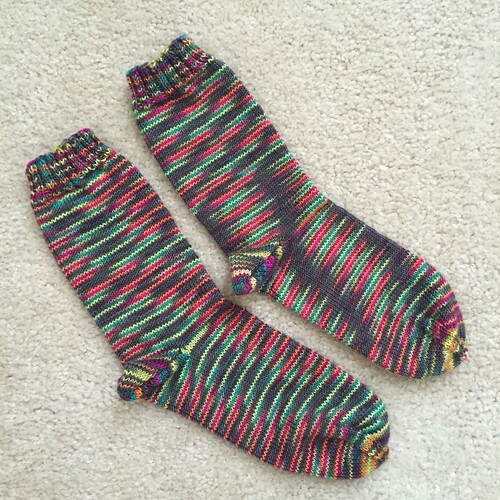 There's not a lot to say about these except that these are the ultimate in portable auto pilot knitting. As soon as I finish these, I'm going to knit the Twisted socks that I've tried to start twice. I've got the perfect yarn chosen for them! I will knit those socks! My Oceanbound is finished! 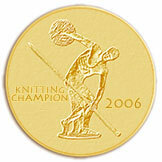 At least the knitting that is. I've got to weave in ends (this is becoming my theme song lately) and block it, but it is off the needles. This is my project for MadMay (the Madelinetosh KAL) and Eat Sleep Knit's May Free For All KAL. It was a fun knit, very much a TV knitting kind of project, and even the lace was simple and fast. It also came out nice and big! 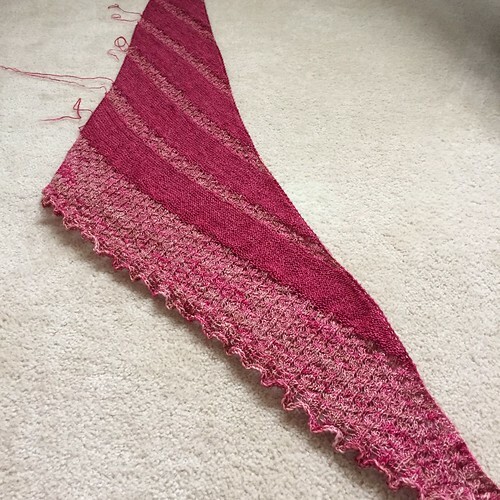 I've finished the dots section in my On the Spice Market shawl! 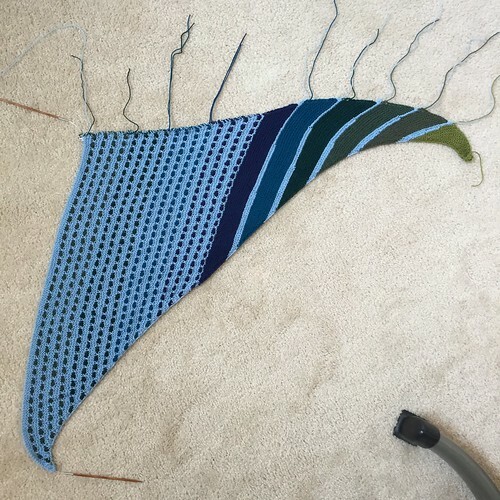 I've now started the stripes for the end section, and I think this section should go pretty quickly, even though the rows are still getting longer and longer. You can't really see the full effect in this photo, but at some point, I really will have to do something about all the ends I have hanging out of this thing! Unfortunately, there aren't enough to call it fringe, so I'll need to weave them all in. 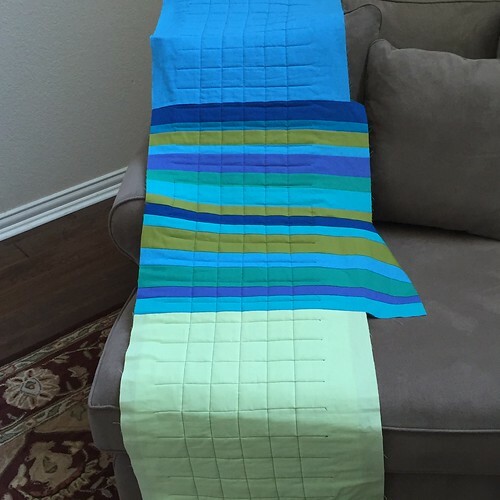 I have finished my table runner for Loopy Academy! This is my last official project for Loopy Academy, both sewing and knitting editions. 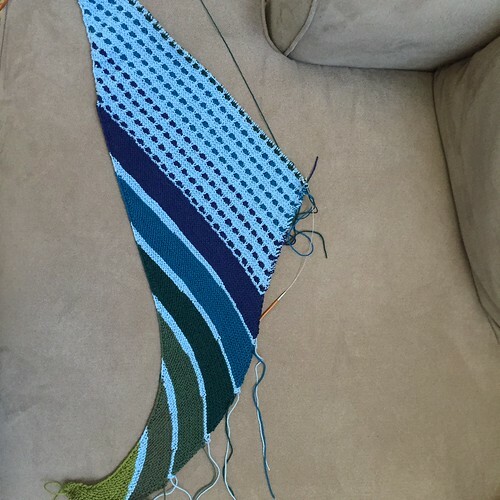 I'm still knitting on my extra credit, but that should be finished soon. 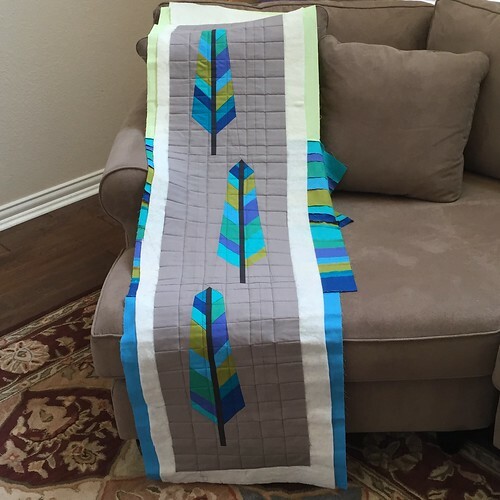 I used Anna Maria Horner's Featherbed pattern to make the runner, and honestly, I'd really like to make an actual quilt with this pattern, maybe using batiks for the feathers. 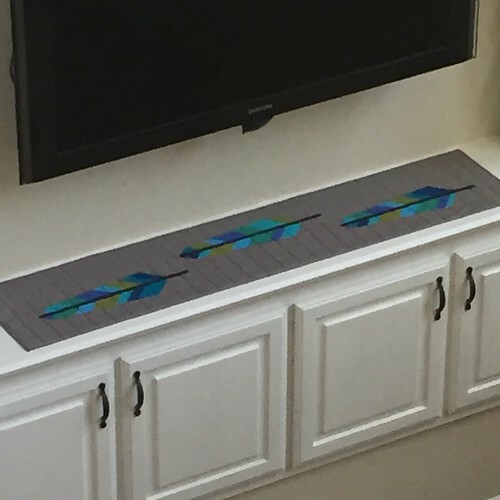 It's a fun block to piece (although technically, each 18 inch finished block uses two feathers), but it must be sewn carefully as there are places where you join bias to bias (assuming you cut the pieces to keep the outside of the block on the straight grain). I pieced the backing with the leftover strips from the feathers and a couple of fat quarters that I didn't use in the feathers (one was too light and the other was too close to a blue I did use). It was quilted in a simple two inch grid and bound in the same fabric I used for the background. Here's an action shot of the runner being used by Max. He's not supposed to be up here, but he's never been too concerned with our human rules around here. I'm knitting my last dark stripe before the final, wide lace section! This has been such a fun project to knit! 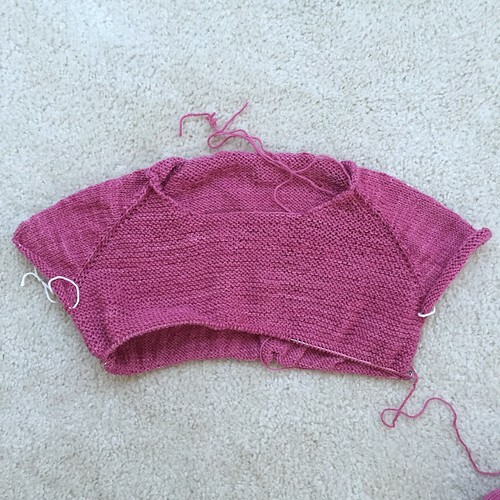 It's easy to pick up and put down, the lace is simple to work and the garter stitch is mindless, autopilot knitting. You can see the size it is thanks to my fuzzy photobomber here. He was just sure I needed some help. I tried to get a photo to show the colors better, but the Vermillion (the garter stitch) isn't photographing as dark as it really is. 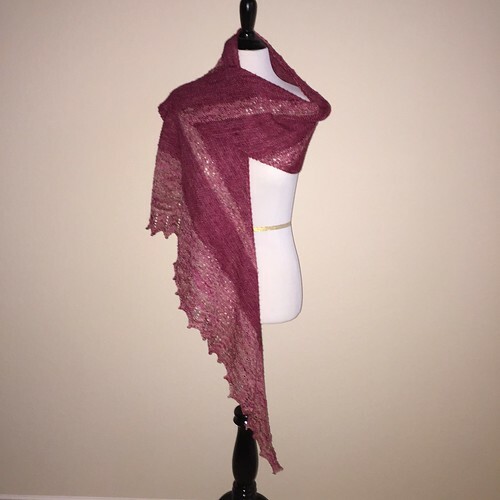 Apparently, both Vermillion and Fragrant (the lace color) are being discontinued by Madelinetosh. This is the first time I've used Fragrant, but I've used Vermillion several times. I'm trying to decide if I need a Sweater Quantity before it's gone forever. I finally got my backing pieced for my table runner, layered the whole thing and got it quilted! I've been dithering about how I wanted to quilt it (dithering is a great word, isn't it? ), so I wasn't really feeling like I HAD to get the backing done until I decided what to do. Normally, I'm a fan of very heavy, dense quilting. For this project however, the feathers are so big and bold, and the solid fabrics emphasize that, I felt that heavy, dense quilting might be too much. I found a dark chocolate colored thread in my stash that matches the feathers' shafts and decided to quilt a simple grid on top. I considered a diagonal grid, but there isn't a single 45 degree angle on this quilt, and I was afraid it might look really weird. Once I made up my mind, everything went together really quickly. As you can see, I used the scraps from the feather piecing in the center of the back, along with a couple of extra fat quarters that didn't make it into the top. Now I'll just trim the edges and bind it and this project is finished! I'm moving right along on my spots! I've got four colors done now and I'm just about to start with the fifth color. After the spots are all finished, there are more stripes. The spots aren't difficult, but they aren't pure autopilot knitting either, I have to pay attention to each row. 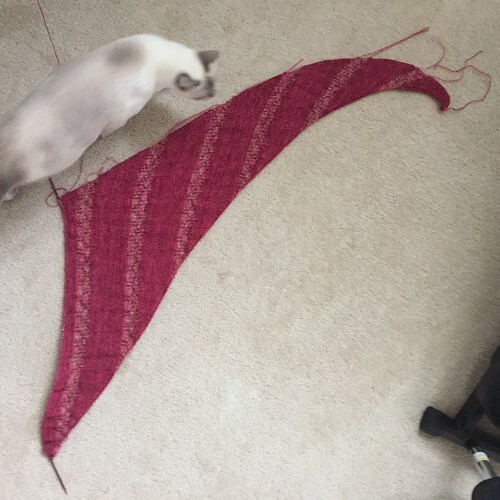 I think I'm past the halfway point if I'm just measuring the total number of rows, but the rows get longer and longer as you go. 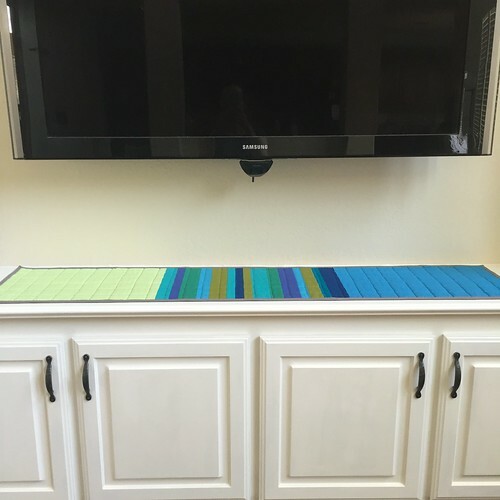 This is a fun project, and I love getting to use so many different colors in a single project! Just deciding which colors to use was fun. 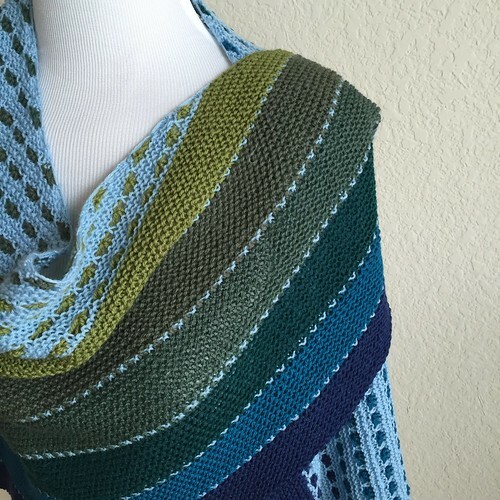 Every May, the Madelintosh Lovers group on Ravelry does a MadMay KAL. I've never participated in it, but this year, Eat.Sleep.Knit is doing a Free For All KAL in May also. I decided to double dip and do both of them with a single project! This is my Wine Dark Sea. The pattern is Oceanbound and I'm knitting it in Madelinetosh Tosh Merino Light. Vermillion is my main color and Fragrant is the lace. 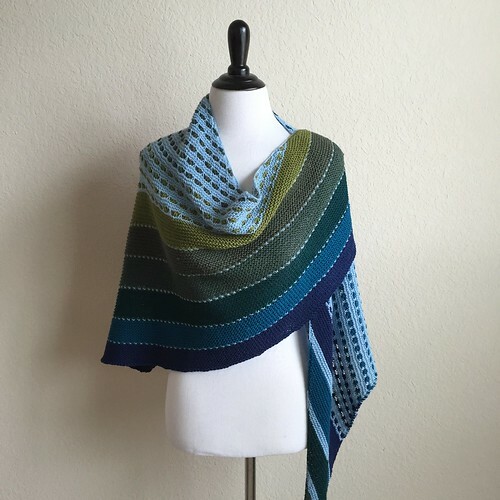 This is the same designer who wrote On the Spice Market and the shape of the finished shawl/scarf/wrap is similar, but I think this one is a bit smaller. 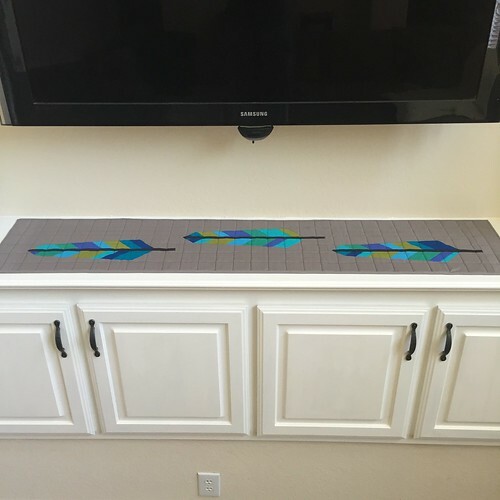 Could someone please send me upstairs later today to sew together the backing for my table runner? 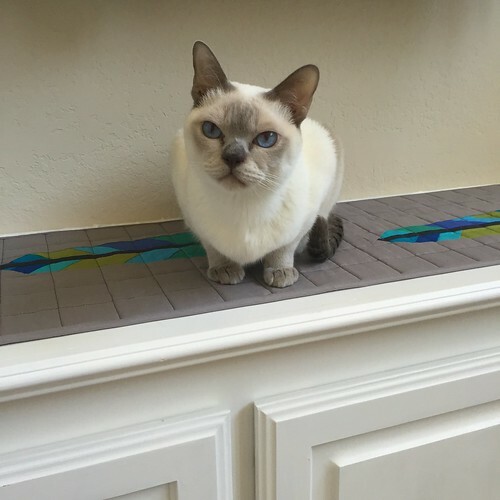 I really do need to get started on the quilting! I'm moving right along on my extra credit for Loopy Academy! I've just started the third color in the middle dots section. 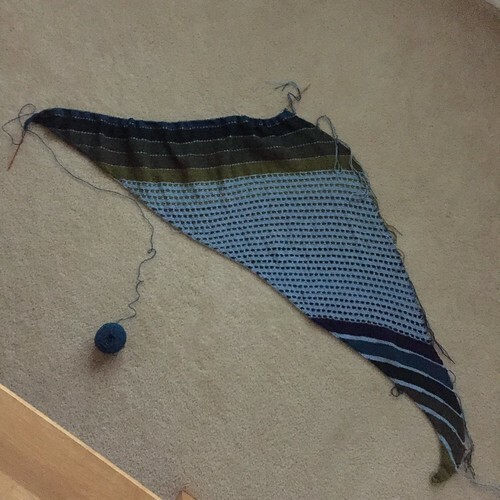 I can tell already that this will be a big shawl/scarf/wrap. It will be nice and snuggly when it gets cold, like yesterday morning. (It was 47 degrees here, in Texas, in May, yesterday morning - that's crazy!) We had to snuggle Max under the down comforter, but he survived. He doesn't appreciate such extreme temperatures! At some point I have to quilt and bind my table runner, and I haven't uploaded any photos for Loopy Academy this semester - neither sewing or knitting. I probably should get organized and get all that done! A plain vanilla, stockinette sock is working much better than a fancy stitch pattern did with this yarn. 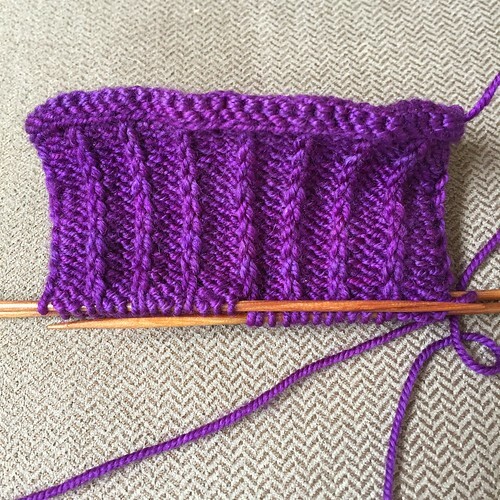 I honestly can't explain why the pooling pattern changed partway down the leg (the number of stitches stayed the same, as did my needles and my tension), but I think it would look even weirder with the slipped stitches of Twisted. 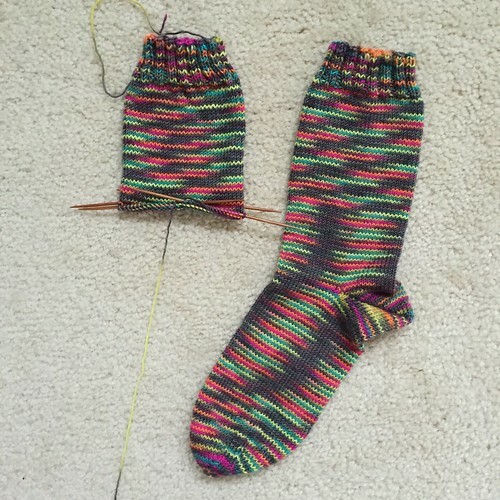 Also, I'm super curious what the pooling pattern will be on the second sock! On an only mildly related topic, I have a skein of sock yarn in my stash that will work perfectly for Twisted, and after starting it and frogging it twice, I really feels like it deserves a chance to get knitted next.